Awww Henri Maltese... The owner of a fledgling dog-training academy in Salisbury (great now I'm starving) has come up with a bizarre money-raising scheme. Mary Stadelbacher figured that if she could teach dogs to become service animals for the disabled, why couldn't she teach them to hold a paintbrush and swab a piece of art? Two years later, she's got a collection of abstract paintings created by her three service dogs in training. Twenty of the works are being shown this month at a gallery at Salisbury University in Maryland. One of the original works has sold for $350. Reid Bryson, known as the father of scientific climatology, considers "global warming" a bunch of bullsh*t. Thank you. Finally. Come up with a new excuse for the worlds every problem. How cute... Australia and the U.S. launched a massive war game today aimed at honing their ability to act together against threats to Asia-Pacific security. Will you look at the size of that goddamn monitor!? This is f&cked... Six were killed Saturday at a drag race in Tennessee. All of the six killed were either in their teens or early 20's The accident injured at least 18 others, including a 5-year-old boy. The crash happened during an "exhibition burnout"—when drivers spin their tires to make them heat up and smoke; the smoking car skidded off the road and into the crowd when the driver lost control. There was a guard rail along part of the highway, but not along the stretch where the crash occurred. Here's a gallery of photos of celebs eating. I have so much to say that I'm at a loss right now. An illegal poker den frequented by AJ Soprano / Robert Iler and several yet-to-be-named NBA players was robbed laz night. I guess dudes with guns burst into the Upper East Side spot at around midnight and ordered the club's 70 or so patrons to hand over their money. Dear Lord why is Bob Barker is endorsing Rosie O'Donnell as the new host of The Price is Right?! Are you all happy now? 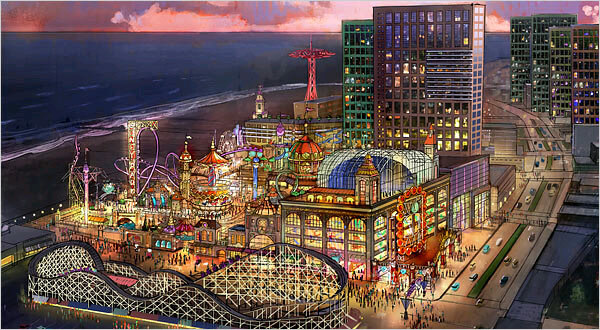 I'm not... No Luxury Condos in Revised Coney Island Plan... There will be no 40-story tower and no rental apartments. The new plan calls for more of the new, edgy and outlandish rides and attractions that the resort was once known for (when back in 1930?!) The new plan continues the idea of a glass-enclosed water park, but adds three hotels, 400 time-share units, restaurants, shops, movie theaters and high-tech arcades. So this is all OK with the Brooklyn-transplant-hipster-protestors-from-Minnesota but not the condos?! I'm confused. What was so awful and blasphemous about having condos in Coney Island exactly? I can't recall. You are all so dumb. Gianfranco Ferre, the Italian designer known as the "architect of fashion" for his structured, sculpted shapes and for his groundbreaking tenure at Christian Dior, died Sunday at a hospital in Milan after suffering a massive brain hemorrhage. Giorgio Armani, arguably the king of the "Made in Italy" world to which Ferre also belonged, said he had long admired Ferre's artistic and intellectual work. Ferre himself cut a unique figure, a big teddy bear of a man dressed impeccably in three-piece suits. Donatella Versace called Ferre a man "from another time" who helped change Italian fashion. It's a sad day for crinoline. Ooooh speaking of Milan... I heard this story over the weekend and I loved it: An airport in Milan had to be shut down for a few hours while some 200 volunteers blew whistles and waved their arms frantically to scare away a giant tribe of wild hares and rabbits who had taken over the runways Hahahahaha! 57 hares and 4 wild rabbits were caught and all transferred to a wildlife preserve. Awwww! There isn't much I love more than a good animals being mischievous story. 30% of Cubans are overweight. Rent still due on the first. AIDS and cancer, still incurable. A new chip could prove an important step in persuading computer makers to incorporate USB technology. A few wireless USB products are already on the U.S. market, but they send and receive signals over a frequency that isn't legal in most of the world because of potential interference with radar. Chip designer Alereon Inc. said they're releasing the first chip that uses a frequency band that is legal all over the world for wireless USB, a technology with the potential to cut the tangle of cables surrounding computers. Buy Alereon. New York gossip columnist Claudia Cohen has died. "Hi. I'll take a caramel frappuccino and this Sonic Youth CD, oooh and these madelines, too."